This week we have had a number of signs from official Party media of more conservative posturing on media policy. 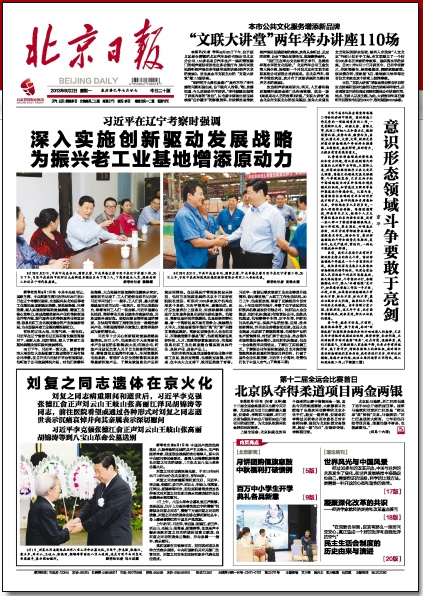 Editorials from both the central-level People’s Daily and the Beijing municipal-level Beijing Daily have invoked Xi Jinping’s recent speech on ideology and called for greater vigilance and a tougher hand from Party leaders (and in particular propaganda officials). The gist of the editorials is that China is in the midst of a bitter “struggle in the ideological sphere” — a “fight to the death.” The chief battleground of this “struggle” is China’s internet, where Western hostile forces have vainly attempted to . . . bring down China.” The internet is a chaotic space, and it must be dealt with robustly and without fear or reticence. The “showing one’s sword” meme has spread rapidly across Weibo over the past two days. The following cartoon by artist Kuang Biao (邝飙), posted on Tuesday night, was quickly deleted by censors. 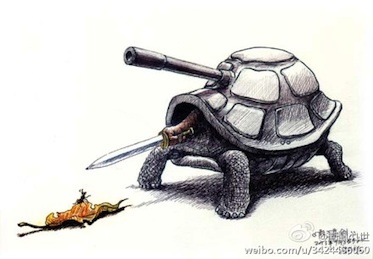 Kuang Biao satirizes the notion of “showing one’s sword.” The party is a sluggish tortoise-tank hiding in its shell and drawing its sword against an ant, a reference to the term yimin, literally “ant people” (蚁民), or ordinary citizens. Kuang’s cartoon sums up the issue quite well. 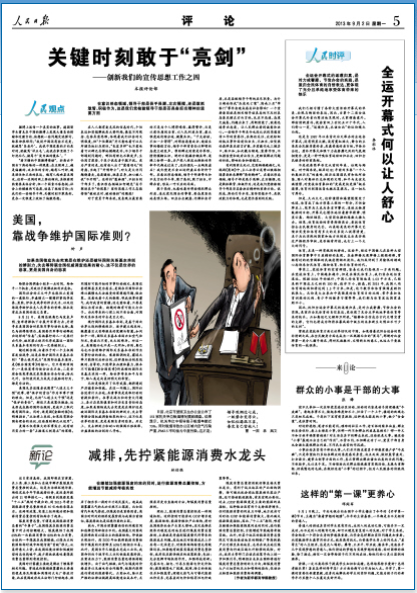 While the Beijing Daily editorial suggests China is in the midst of an urgent struggle against “Western hostile forces” — a term associated with hardline, leftist pronouncements — ordinary Chinese are the target of this “struggle.” The Party is concerned about the use of the internet, and particularly social media, to air their frustrations and appeals. But there is an obvious asymmetry of power — hence the powerful gun atop Kuang Biao’s tortoise. Leike’s admission that he couldn’t understand the mood on Chinese Weibo exposed one phenomenon in China’s public opinion environment: on the internet, the more biased and aggressive language is, the more people validate it, and the more rational and positive something is, the more people kick up a fuss and attack it. The roots of this lopsided public opinion trend on the internet need to be analyzed in detail, but there is one factor that cannot be overlooked: this equivocal attitude in society indulges extreme language; and our leaders, when they do not show their swords at the key moment, also to a large extent allow extreme ideas to hold sway. In an era in which everyone has a microphone, the larger trend is toward personal expression and the liberation of ideas, and the capacity to tolerate different views and accept different ideas is a measure of how sophisticated our society is. However, “liberating the personal” does not mean that the rational can be crushed without any hesitation, and “accepting diversity” does not mean that we can recklessly disregard truth and fact. Many leaders, when they confront a problem, either because they are afraid to speak, or because they are afraid they will suffer insult, choose to say little or even nothing. Even more serious are those who, because they “cherish their reputations,” play the part of the “enlightened gentleman” (开明绅士). They skirt around serious questions, remaining ambiguous out of an instinct for self-preservation, worried that someone might accuse them of being “unenlightened” (不开明). . . The courage to show one’s sword also means having a firm attitude and holding a clear position on those things that violate the interests of the masses and go against Party discipline and the laws of the nation. Responding to the misgivings of the public and resolving social tensions is the duty of leaders at every level. Why did incidents like the Sanya food poisoning scandal or the killing of a Hunan watermelon seller have such awful social consequences. One important reason was the failure of relevant leaders to act properly, or their looking the other way . . . When a problem appears, it should be judged clearly and a position taken quickly, so that what the people see is honesty and determination. A number of leaders still have not recognized the importance of ideological work, and they fear sticking out their necks on a number of hot incidents that are the focus of public opinion and on which opinions are widely divided. . .
Secretary Xi Jinping emphasized in his speech during the national propaganda work conference that ideological work is of extreme importance to the Party. [The Party] must, [said Xi], see the big picture and grasp overall trends, focus on major events, and accurately find breakthrough points . . . Right now, we are in the midst of a great struggle with many new historical characteristics, and the struggle in the ideological arena is one important aspect. We must be firm about marxism’s leading position in the ideological sphere. We must be firm about the common ideas that form the foundation of the united struggle of the whole Party and the whole people. We cannot lack consciousness of our position and our struggle. We cannot vacillate. Even less can we be unsure of ourselves. If we do not have the proper grasp, a hard grasp and a strong grasp with hand of ideological work, if we are loose with how we handle the struggle in the ideological sphere . . . then in the end we will have major problems, and we will have historical problems that are impossible to undue. The disintegration of the Soviet Union and the major changes in Eastern Europe years ago, and the unrest, war and political change among countries in north Africa all should give us deep pause. In struggling, we must not fear the ghosts, and we must not believe in fallacies. We must have the courage to grasp and control. We must have the courage to show our swards. Facing a global public opinion environment in which “the West is strong and we are weak” (西强我弱) and a situation in which the West is overbearing, particularly as the West “bad-mouths” our political system, our economic situation, our social problems and our cultural traditions at every turn, slandering us and making up lies to blacken us, we cannot be polite, and we cannot just hope they can offer balance, but rather we must do everything we can to speak our reasons and to advance them, strengthening our discourse power internationally. Faced with a complex ideological sphere at home, we must differentiate and focus on fuzzy understandings, problems in thinking, problems in political standpoint and other situations, doing our work meticulously. The internet has already become the principal battlefield for today’s ideological struggle. Western hostile forces have vainly attempted to use this “biggest variable” (最大变量) to bring down China. Whether or not we can stand and be victorious directly concerns our country’s ideological security and regime security. If we do not take up our position, then others will take up position. It now seems that we must take the online struggle as the priority of priorities and the urgent matter of the moment in our ideological struggle. . . In the final analysis, if there is less confusion on the internet, if the online space can be cleared up, this can only be good, not bad, for the security of our nation and society, and for the good and prosperous lives of our people. While there is no smoke to be seen in the struggle in the ideological sphere, it is nevertheless a fight to the death. There are no enlightened gentry on this battlefield. Compromise will not bring harmonious compromise — only through struggle can we survive and develop. Faced with a complex ideological sphere in the present day, we must not ignore provocations or remain silent, we must not be vague and indefinite, and we must not retreat. We cannot abide ambiguous ideas that seek only to play it safe. . . We must have the courage to struggle. We must have the courage to show our swords. This is our imperative choice in the present day.